After my second day of the season at Plattekill, I sat down to write. For a ski blogger from the flatlands, the underlying themes don’t really change much. Life is often a balance between responsibility and the pursuit of a moment. Our plan was to spend the holiday at our place near Gore. But my girls weren’t feeling it. They didn’t want to make the drive, and based on reports from the mountain my enthusiasm for an all out sales pitch was limited. The recent weather has been hard to ignore. Last week’s rain was followed by colder temps, leaving things firm across the east. There was however one small ray of light: the National Weather Service issued a Winter Weather Advisory for the NY metro area and parts of southern NY for Saturday night. 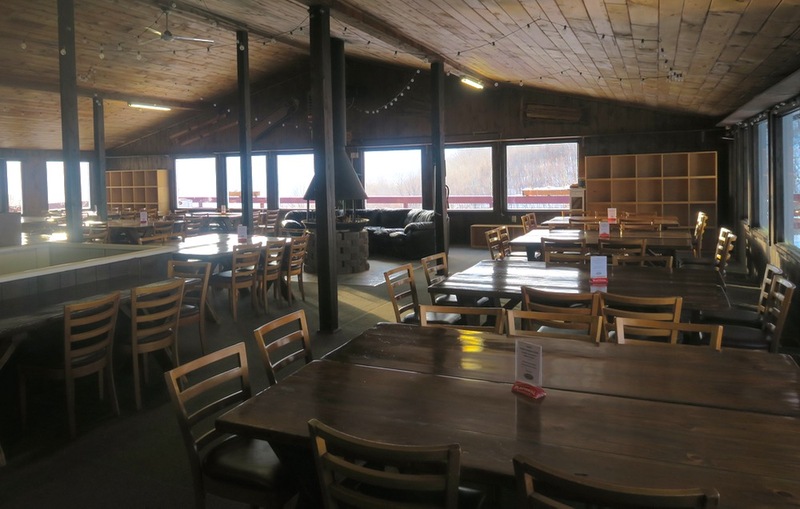 It looked like Belleayre was in the best position to pull snow out of the system and I considered making my second visit this season to the ski area in Highmount. But on what was likely to be the busiest day of the year, I headed for Plattekill. I arrived at 7:30am on Sunday, even earlier than I expected. Laszlo was plowing the parking lot which is always a good sign. The scene was a little bit magic, with fan guns blowing, natural snow falling and the sun shining all at the same time. I killed some time taking pictures and enjoying the silence in the lodge. Then I booted up and went out to wait by the triple. I knew we were at least 30 minutes from loading, so I asked Doug on the magic carpet if he minded if I earned some turns on Bunny Hop. Soon after 8am regulars started to collect at the lift and I pulled up next to one of my favorite Plattekill ski partners, Chris Stearns. He began sweet talking the lifties and somehow we found ourselves heading up, before patrol. As we got close to the top it became apparent that maybe four inches had fallen up high. Since we were on the fourth chair, and everyone ahead of us went straight for The Face, we skated quickly over to Blockbuster for first rips there. I let Chris go first so I could grab the shot above. The first runs were uncrowded and floaty. For most of the morning you could find good strips of untracked snow on the sides of all the trails. Sundown had been largely ignored and I lapped it four times after I figured that out. 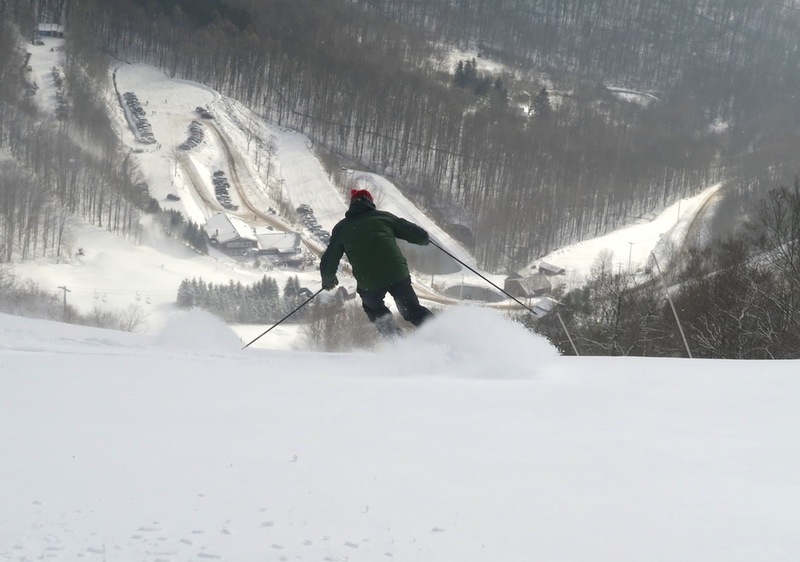 It looked to me like the busiest day of the season at Plattekill. 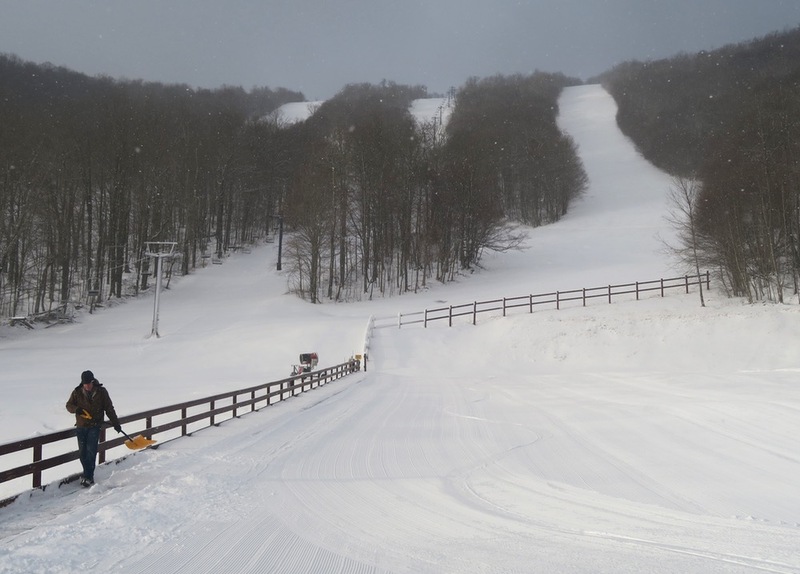 Most skiers were drawn to the snowmaking under the triple, where it was soft, top-to-bottom, all day long. At it’s peak the line for the triple was five minutes long, while the double remained ski on. On the double side, the underlying surface was firm, but the new snow really made a difference. On the uncrowded trails, you could find some snow and pick your spots to turn. In the early afternoon, I grabbed lunch in the bar and it was more crowded than I had ever seen it. After lunch I hit Powder Puff and one last Sundown to Face, grabbing some untracked right under the fan guns that were now shutdown. Driving down the access road, cars were parked all the way down to the farmer’s field. On the Thruway, I cranked the Moody Blues on a continuous loop and sang my brains out. I had no regrets for the crazy lengths I’d gone to, to grab a moment. You and the girls made the right call Harv. We skipped Saturday. Sunday was a zoo. 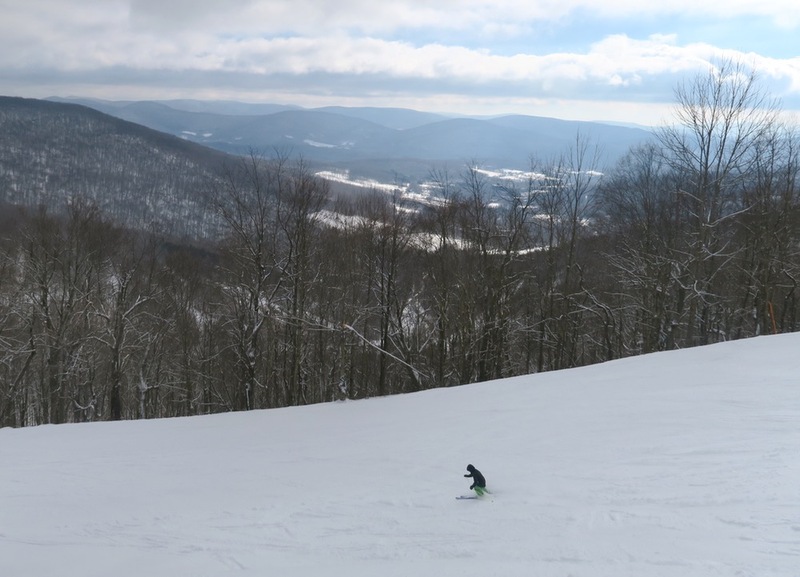 It felt like Killington on a holiday weekend. Echo by the afternoon was scraped to boilerplate with what felt like 100 low level intermediates trying to snowplow the headwall. Yesterday was better but overall it was a good weekend to stay to the south. 7:30 arrival: you leave your house at 4:15? Agreed on Belleayre…first couple hours were some of the best but it definitely became a zoo. Praying the rain stays away now! It was a great weekend indeed. Unfortunately I had a prior commitment on Sunday but Sat was good too. You could almost feel the energy emanating from the mountain and it’s workers saying, it’s gonna be a rough week, but this is definitely not the end as we bite the bullet. We are glad you are getting out. We made it to Belleayre a couple of weeks ago. Everyone was out this past weekend skiing -sad to see that its so hot and wet now there. In Texas at the moment and can’t wait to be back skiing. You made the right call!! 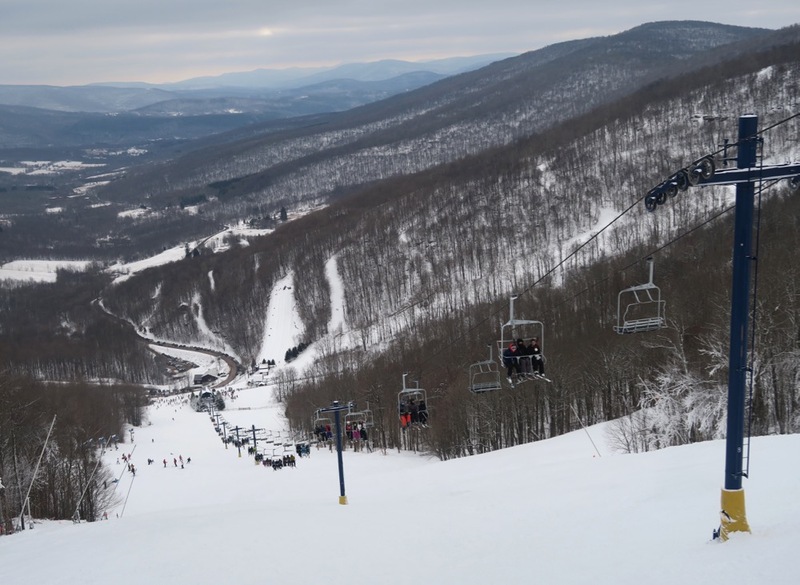 Nice report, I look forward to skiing Platty again someday, hopefully with the NYSB. it was a pleasure and thanks a lot! Always great to see and ski with you too chris! @2000 do you ever come east to ski? Meeting at Plattekill would be excellent. James that is just about the time I headed north. I’m far behind on my ski days this year (21) and hope for hitting my recent season average of 35 looks extremely thin. Never the less I am still hoping.